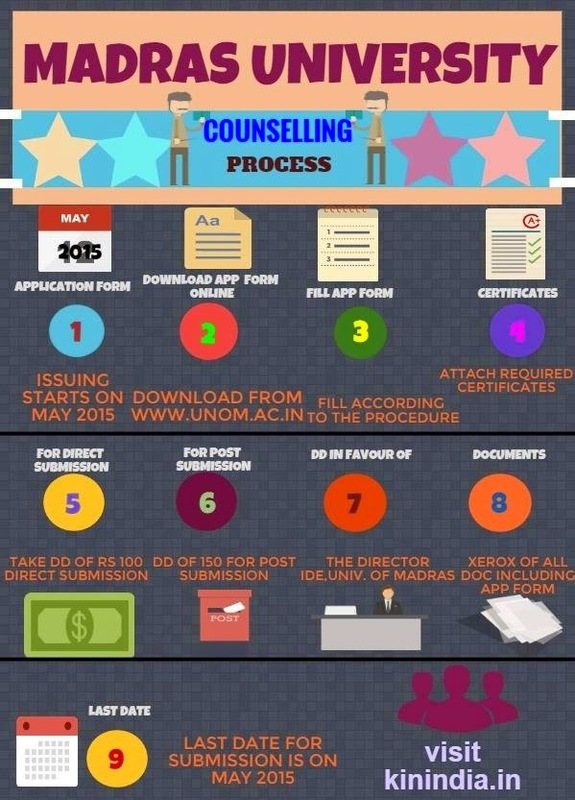 The University of Madras has started issuing the application form for UNOM counselling / entrance for various Arts and Science departments like BSC, MSC, BA, MA, B.COM, M.COM, Psychology, MCA, MBA and for all UG and PG courses. Here we have enclosed the details about the how to download Madras University Application form online and how to fill it out. The candidates are requested to read the instruction carefully and then start filling the University of Madras Application form for affiliated arts science colleges in Tamilnadu. The candidates should pay Rs.100, if they submit the application form in direct and should pay Rs.150, if they want to pay by post. How to fill the University of Madras counselling application form? The candidates may not clear on how to fill the application form here we provide the instruction to the candidates about the counselling. Transfer Certificate from the institution where you have studied. The Diploma students has to attach the Provisional Certificate. If your certificates are in languages other than Tamil and English it should be translated into Tamil or English. You should get attestation from the Gazetted officers on the original translated certificates. The candidates who have not passed in Higher Secondary Examination are not eligible to attend the Madras University counselling. Take Xerox copies of the original before sending it. and it must be payable at chennai. The last date for submitting the application form for BSC, MSC, BA, MA, B.COM, M.COM, Psychology, MCA, MBA, distance education and for all UG and PG courses is declared as May 2015. Keep on visiting to know further details about the University of Madras admission process, counselling procedure, schedule, counselling date, distance education, list of top affiliated / autonomous / non autonomous colleges under the UNOM and latest updates of Madras University.